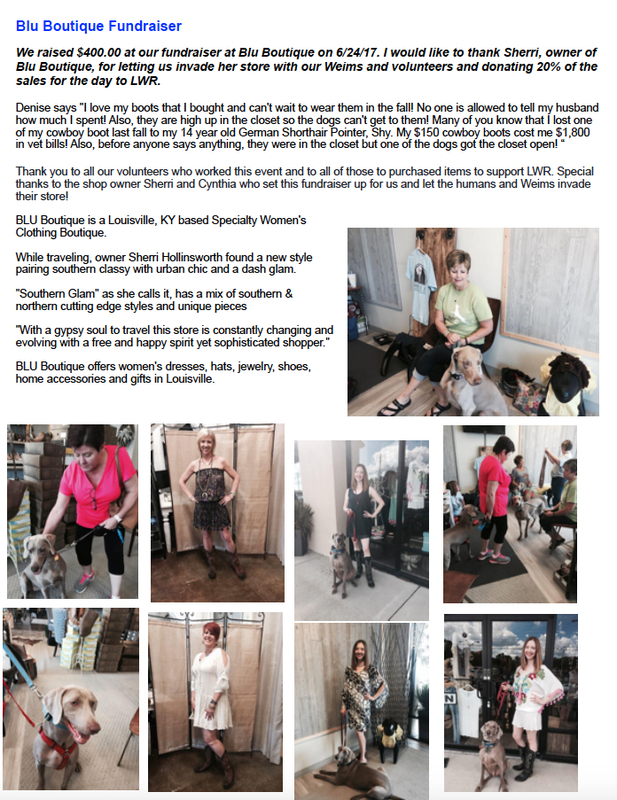 ADOPT | Louisville Weimaraner Rescue Inc.
Do not be impulsive in adopting a dog. Choosing a lifetime companion is a very important decision and not one to be done in haste. The Weims in our program are our first priority. We must be sure they are placed in homes where they will be loved and properly cared for. Some of these Weims have already been in multiple homes, and our goal is to make sure they will not be moved around anymore. Your completion of our application, a phone interview, a reference check, and a successful home visit does not guarantee that a suitable Weimaraner will be found for you. Applicants are not placed on a waiting list in the order of the date of application. Rather, in each case of selecting a home for a Weimaraner, all applications will be considered equally. We do this in order to attempt to match the most suitable home for that Weimaraner. Our decisions are based on matching the Weim’s health, personality, and behavior to the applications received including the personal phone interviews, the in-person meetings with the Weim(s), and the outcome of the required home visit and reference checks. Each rescue member is responsible for finding the best placement for the individual Weims in our program. We reserve the right to place our rescue Weims in the home in which we feel the Weim has the best chance for success. The fact that one Weim is not a good match for your family does not mean another one won’t work out well for you. We know the Weims, and ask that you let us help you choose the Weim that will work out best for your family. Looks alone will not guarantee a love match! As for temperaments, we do not knowingly place any Weim through the LWR adoption program with aggression problems. We attempt to expose the Weims to a variety of situations and people so we can observe how the Weim reacts. We try to test the Weims with children, other dogs, and cats and will inform you of our observations. Unfortunately, some of these Weims have come to us through shelters or without prior knowledge of their behaviors and lifestyles, and it is not possible to know complete health or behavioral backgrounds, but we do try to learn as much about the individual Weims as we can. In most cases, we have the Weims in our foster homes prior to making them available for adoption in order to learn as much about their personalities and habits as we can. The more we learn about a Weim, the easier it is to make the best placement. We cannot guarantee that any Weim placed through rescue will never bite. Every dog is capable of inflicting a bite in certain circumstances. We cannot accept responsibility for any Weim’s behavior once it leaves our possession. We promise to not place any dog we know who has a history of aggression or that we think may pose a threat to anyone. The first step in helping us find you a wonderful rescued Weim is to fill out an application for adoption. This helps us by providing information about you, your home, your family, and gives us a general idea of what you are looking for in a family friend. 1) Fencing. Lack of fencing does NOT automatically preclude adoption, but could limit the Weimaraners that would be considered for your home. Weims are very energetic, and need a safe place to exercise. Walking a dog on a leash in the driving rain or snow is no fun. Tie-outs or chains are not acceptable alternatives. 2) Rental agreements. If you rent your home, you must provide an ACTUAL copy of your agreement and/or a letter from your landlord allowing you to keep a Weim over 50 pounds. 3) Current pets. We prefer all owned pets be altered, current on all vaccinations and must be on heartworm preventative medication. We do contact your veterinarian to ensure he or she feels that you are a responsible pet owner capable of providing a quality, permanent home for a Weim. 4) The Weim is an indoor dog, and we will place them only as indoor family pets. They are very social and people-oriented dogs, and if left alone for extended periods of time they frequently become destructive or adopt other unwelcome habits. All Weims placed through our rescue are spayed or neutered if over 6-9 months of age, up to date on vaccinations, heartworm tested (and treated as necessary), started on heartworm preventative, micro chipped, and have complete physicals prior to adoption. Any other known medical issue the dog has upon arrival is treated prior to placement. We have a full disclosure policy on all known medical history and medical records. Health problems are something we cannot predict. We hope that all Weims placed through our rescue program live long, healthy lives, but there are no guarantees. All expenses after the adoption (including veterinary expenses) relating to the Weimaraner would be your responsibility. There will also be an adoption fee from you to LWR to defray expenses relating to rescue efforts prior to your adoption. Unspayed or unneutered puppies are an additional $100 at the time of adoption. This $100 is refunded upon proof of surgery sent to us by the puppy’s age of 9 months.